I attended TahoeDreamin 2016 and had a delightful time. Here is my recap, so I don’t forget. I have attended 2 Dreamforces and nothing beats Dreamforce for a software conference. There is something in every direction. That is wonderful and I am excited to go back, however this smaller event seemed like a place to really meet some advanced admins and get some knowledge I wouldn’t have the chance to get in other ways. So I posted on twitter that I was interested in going. It was pretty random that Bill Greenhaw replied to me that I had WON a free ticket to TahoeDreamin’. That message came on the same week that I passed my Salesforce Sales Cloud Certification. 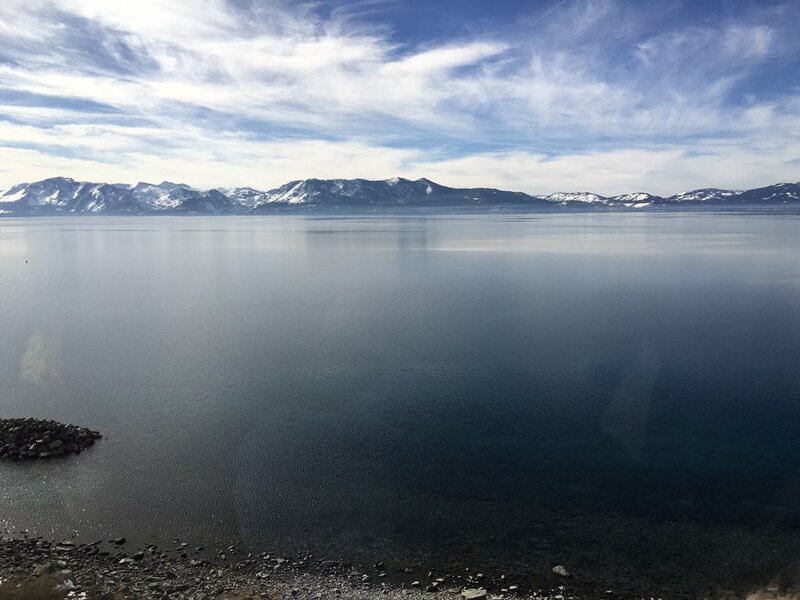 After some back and forth, it seems that my wife’s family would not be able to go to Tahoe, and the options for my family to travel with me would be limited. The free attendance the conference was a tiny amount compared to the flight and hotel, however it was decided (after many discussions with my family) that I can go to TahoeDreamin as a reward for passing my Salesforce Service Cloud Certification. Another pre-conference note: TahoeDreamin leadership sent out an email request asking for volunteers on Thursday, Friday and Saturday. Since my flight was to land earlier on Thursday, I volunteered to help put attendee bags together and help other things as well. I thought this would help keep me engaged and further my networking at the event. (It did!) I would highly recommend that if you get the chance to volunteer, it is a great way to meet people and make some really good connections. My flight into Reno landed around noon, and I found the South Tahoe Airporter shuttle from Reno to Tahoe. I bought a ticket and was told that the bus was leaving immediately. I grabbed my bag, boarded the bus and was delighted that I got to sit next to Michelle Regal! 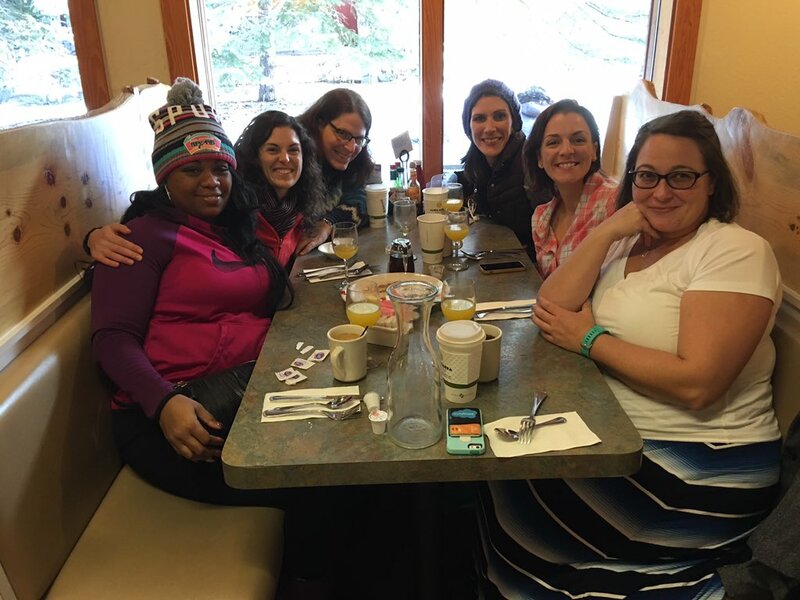 Michelle is not only involved in TahoeDreamin, but the Salesforce Admin at PBS and a nonprofit technology advocate. With my current project at TPT (Twin Cities PBS station), I feel like I am so lucky to have met Michelle and that she talked to me about her upcoming projects as well. We found our way to Harvey’s in Tahoe and got my bags unpacked and headed to Harrah’s to help volunteer. There I met Bill Greenhaw, Zachary Jeans, Sarah Deutsch, Kim McClure , Shonnah and others. Bill took us on a tour of the conference center and all of the space we get to use on Friday. I was so impressed with all the work that had gone on behind the scenes to make this event happen. Friday was the learning day of TahoeDreamin. I will just make a bulleted list of the things I did that day – sorry to my future self, if I have forgotten something. Overall, I went to some awesome discussions and demonstrations. Here is a listing of the awesomeness I witnessed. 3:15pm – 4pm: Happy 10th Birthday AppExchange! What I appreciated about these sessions was that the “Q&A” was real Q&A with real-life scenarios. This was something that you don’t always get at Dreamforce, because it is so fast-paced. I was able to ask specific questions about a product or business process directly with the expert and afterwards people came up to me and started talking to me about the question. 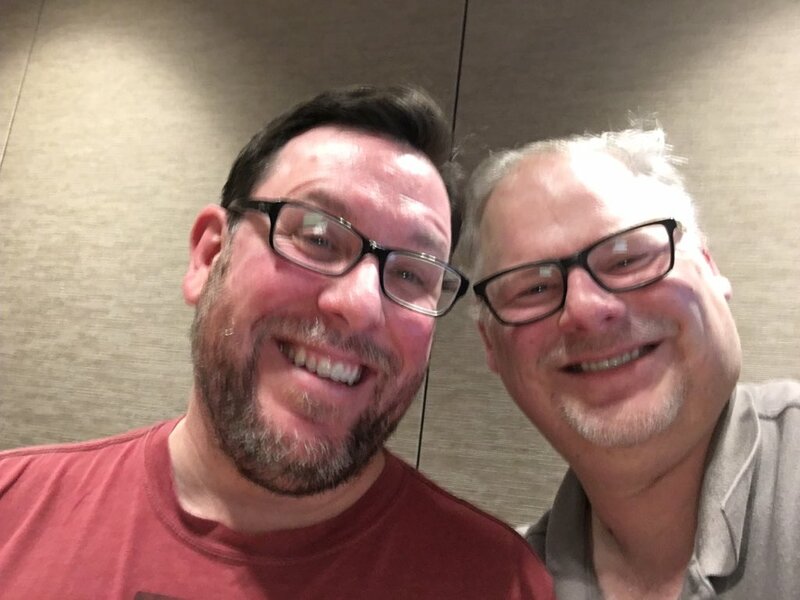 Other admins, consultants, software vendors, and MVPs were accessible for lively discussion over a topic that has been been a personal challenge. This was a great time for inspiration and ideas. Saturday was billed as “Fun in Tahoe Day”. I must say that going into this, I was pretty worried. I don’t ski, don’t snowboard, and wasn’t really ready to do snowmobiling, etc. I did research the Gondola at Heavenly and it sounded like fun. Luckily there were other TahoeDreamin attendees who were interested in going. back up a little bit – first things first. I woke up at 6am and noticed a tweet from Daniel Hoechst asking if anyone was up for breakfast. We decided to explore South Tahoe for some food and landed at driftwoodtahoe.com for a Denver Omelette. 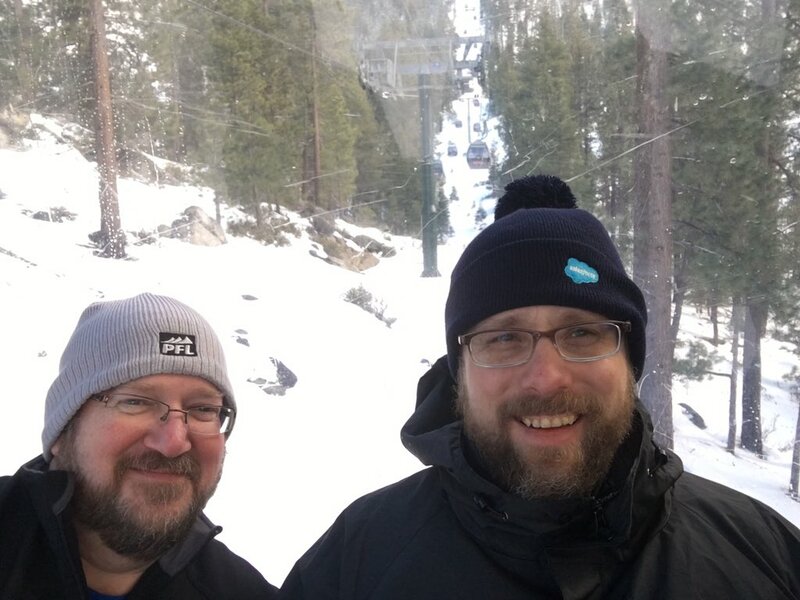 Daniel is a Salesforce MVP and we chatted about Change Management and Change Control, among other things. 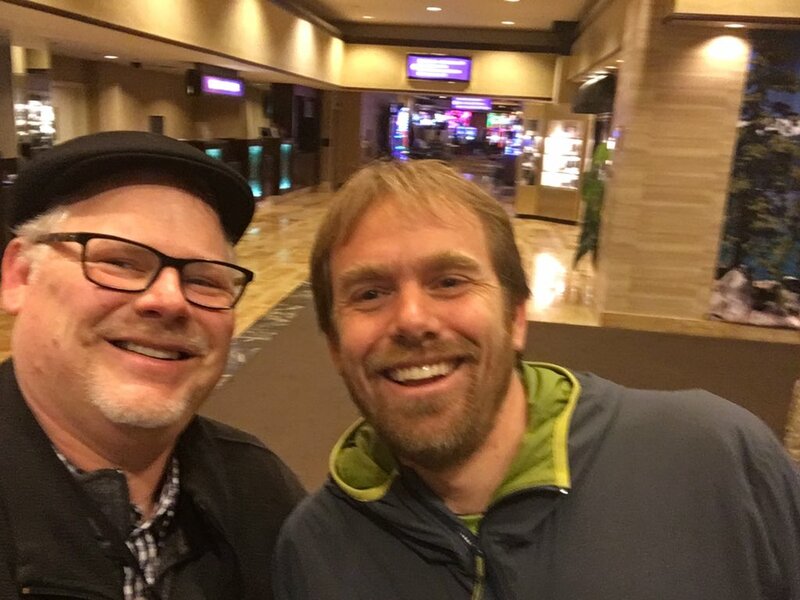 This was an awesome opportunity for me to have a 1-on-1 conversation about our lives and goals for 2016. Daniel has an awesome look on life which I respect. We walked over to a grocery store for energy bars to use later that day then headed back to the hotel. We caught up with some of the WIT group. These ladies seem to always have fun wherever they go. We couldn’t help but notice the smiles and laughter coming from their table. 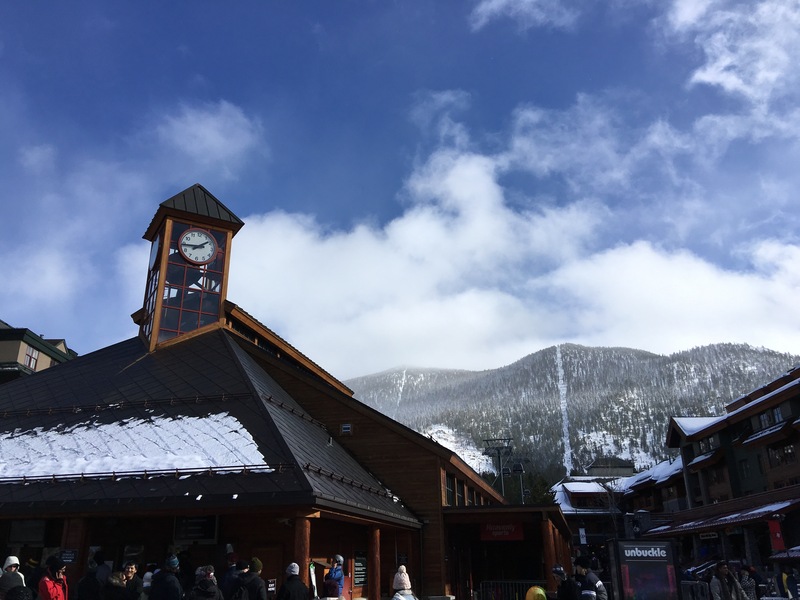 9am: Heavenly tweeted “It’s blowing pretty hard up here today, and lifts are being impacted. The Gondola, Tamarack, Sky and North Bowl lifts are on wind hold.”, however about noon they removed the hold on the Gondola. 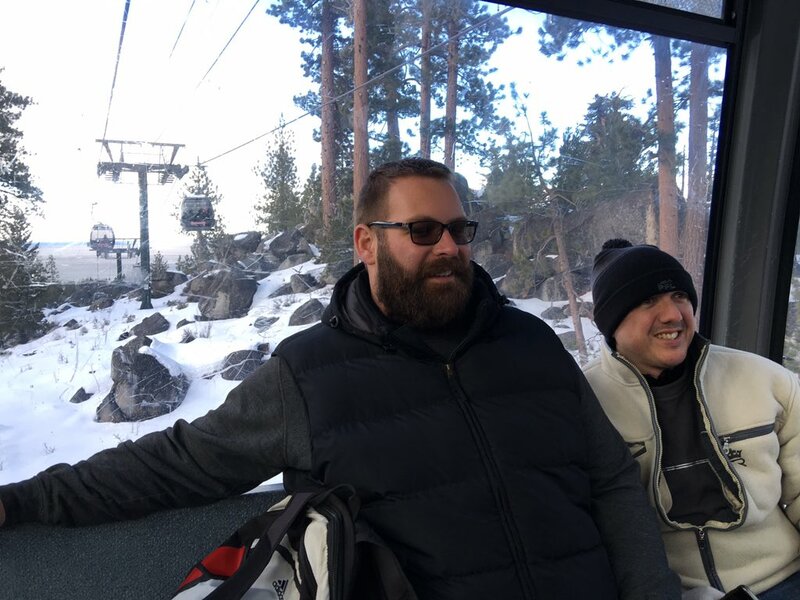 A little after noon, I met up with Eric Dreshfield, Zachary Jeans , Daniel Peter and J-Michel Mougeolle and we all went up the Gondola together. It was an amazing blast. We got to stop 1/2 way up on the lookout to take pictures. It was windy and cold, but we braved through all the way to the top of the mountain to watch skiers and snowboarders having fun. After some time, the DJ in the lodge started announcing that they were going to close the lodge due to weather. It wasn’t working, because the music was still thumping as he was pleading to the visitors “Please leave now! Really, you must go!” It was hilarious in a life-threatning sort of way (if that makes any sense). That night, a group of us gathered for dinner at McP’s Bar in Tahoe for food, drinks reflection and discussions of the future. The next morning, bags are packed and waiting for the shuttle back to the Reno airport, I am staring at this sign that directs me where to go next. I am excited for the next events (for me, they are likely Midwest Dreamin and Dreamforce 2016) and what I need to do to prepare. 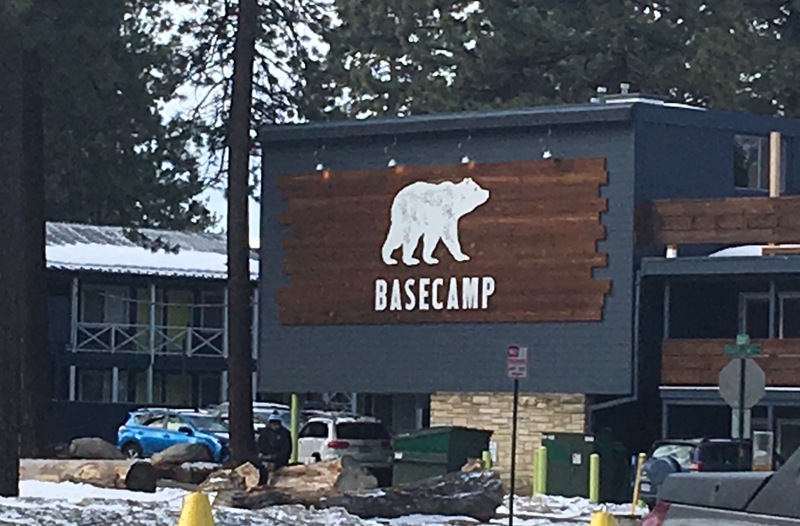 This “Basecamp” sign reminded me to set some Trailhead Goals and that I shall go for it with “bear-like” tenacity. Consider attending a regional event. If you think you would like to go but have trouble affording the attendee ticket, let the leaders know. There may be sponsors who could support you. Volunteer! One of the best ways to meet people is to volunteer your time during the event. Help put together attendee bags, help direct people or offer assistance during the conference. You will be glad you did. Share your professional challenges and success. See if others have had similar difficulties. Have a salesforce challenge that has been bugging you? Ask if others have as well. Need advice on a great App to use or a good partner? People are happy to give referrals if they have a favorite. Ask! I wanted to go up the mountain and asked if others were going and would let me join them. It was a thrill! Enjoy yourself. Wow that was fun and amazing and it is nice to just be in the moment and appreciate it. The relationships you can find at events like this are powerful, so enjoy them. Set Goals. Learn about new ways to use Salesforce and set a goal to try them on your own after the dust has settled from the event.